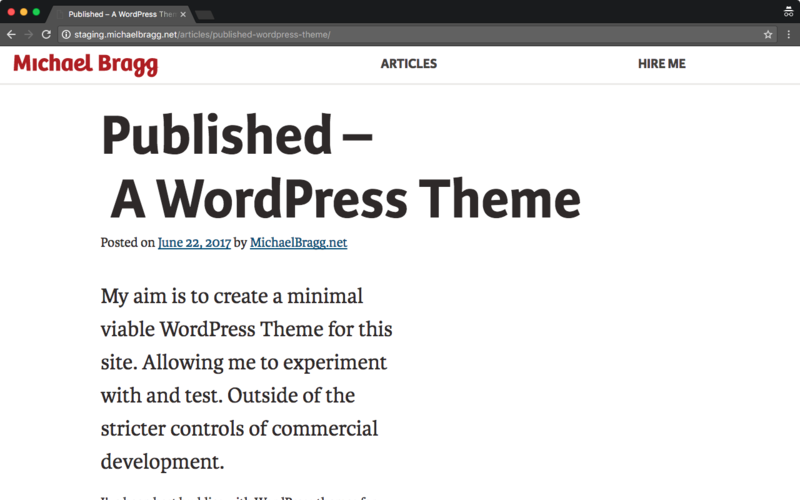 My aim is to create a minimal viable WordPress Theme for this site. Allowing me to experiment with and test. Outside of the stricter controls of commercial development. I’ve been best buddies with WordPress themes for several years now. Building themes for clients and integrating them with bespoke plugins. Along the way, I’ve picked up many tip and tricks. A few bad habits. While growing my knowledge of the inner workings of themes. I’m a strong believer in ‘teach your learnings’. Because, if I can explain how something works and it is understood. In addition, it shows I truly have a grasp on the subject. I hope this will act as a springboard for me. To teach and share the good and bad I discover developing this theme. Screenshot of ‘Published’ theme at the time of the site launch. This is the starting point for my website’s theme. I’ve stripped down Underscores (_s) to leave me with the smallest surface area I need for a theme to run my website on. As this website develops. I aim to extend the theme to incorporate new features I wish to add. Alongside making improvements to the performance and page loading times. To follow the development of this theme. You can view the source code, follow changes, or raise an issue at github.com/michaelbragg/published. Where I will be working in the open. Interested in hiring me to work with you on a project?